Review by Little Blonde Life. 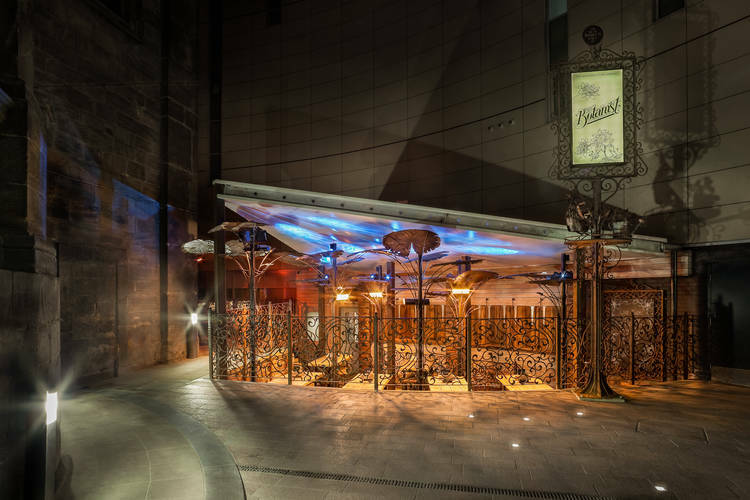 Down at the bottom of the garden..well actually hidden away at the outskirts of the Trinity Centre in Leeds lays The Botanist. Walking through an outdoor patio area and past the open air outside/in kitchen you cant help but feel that everything is a little higgledy piggledy. When you finally enter into the surprisingly big dining area you walk almost into what can only be described as a garden shed and enter into the secret world of the Botanist. It’s a genius tone of walking through the garden into the garden shed that really wowed me and it’s safe to say my expectations remained high. I was here for the Botanist tea party and it’s fair to say it was a very special event where attention to detail had clearly been paid. I was seated in a cosy charismatic area of the restaurant and the table was laid with cute mix matched crockery, tea pots, china cup and tea strainers. I started the evening lightly with a intriguing cup of “smoky Russian caravan” tea which was very pungent and although I wasn’t sure if this was my cup of tea it was one to be tried. My next drink was something I was more familiar with and a lot more bubbly. Once everyone had a chance to mingle the starters arrived. I was delighted and amazed to see the garden theme ran into the menu with potted chicken liver and rum pate with a ginger crumb topping served in a miniature plant pot, accompanied with tangy plum and apple chutney in a mini wheelbarrow. I will admit secretly this made a little sceptical had so much attention been paid to the presentation taste had been compromised? No. It was divine and very morish with all the flavours coming through and it certainly tasted as special as it looked. In addition to the pate we were also served up the classic favourite of houmous board with crudities and flat bread and a portion of salt and pepper onion petals with a sour cream dip. The presentation of the houmous board was rather unique served in cabbage leaves it was simple yet impressive and cleverly in-keeping with the tone of the restaurant. For the main course I had the deli board in which I could pick 4 items to create my own board. I resisted from all cheesing and tried to create a balanced bored with sun dried tomatoes, pickled beetroot and carrot salad, roast chicken and Sharrock’s two year aged Lancaster cheese. I don’t like to blow my own trumpet but I think I did a pretty good job. All the elements were seasoned well and each cooked perfectly, my favourite was the roast chicken..sounds a little dull but it was tender, meaty and basically a good old piece of chicken, although I also cannot fault the sun dried tomatoes oh and the mouth watering cheese. To bring the fabulous evening to an end in style I was treated to some very delicious cocktails. I won’t lie I’ve tasted many a cocktail in my time but these were special. Again in keeping with the tone the cocktails still kept the botanist theme with ingredients such as fresh cucumber, basil and elderflower they were very refreshing and went down a little too easy. My favourite was their signiture “the Botanist” cocktail with Green Mark vodka, Bacardi rum, elderflower liqueur, red amaranth, mint, jasmine syrup and lime juice topped with lemonade.